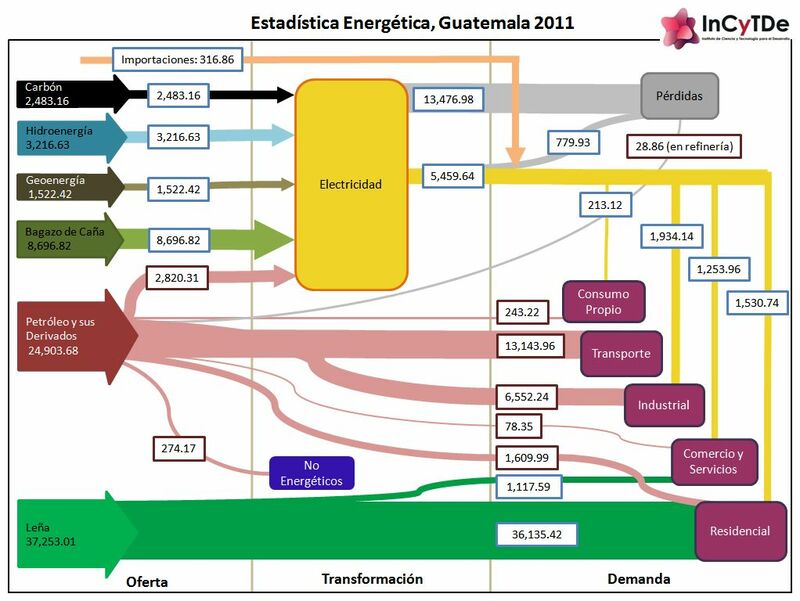 After presenting the energy balance Sankey diagrams for Guatemala and Costa Rica in recent posts, here is a similar diagram for Mexico. Flows are in Petajoule (PJ) for 2011. Found this also in the INCyTDE blog post mentioned before. The INCyTDE blog article that featured the Energy Balance for Guatemala presented in a post last week also contains two other energy flow diagrams from other Central American countries. 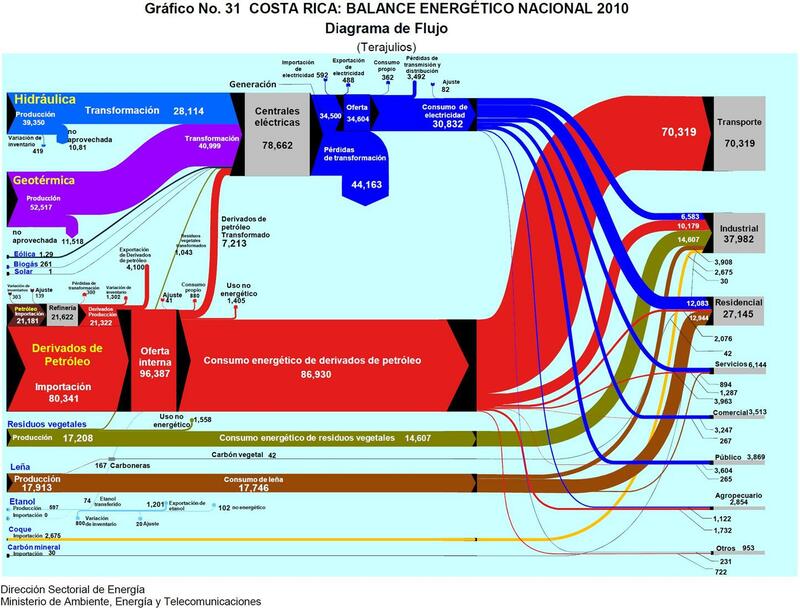 Here is the energy flow Sankey diagram (Balance Energetico Nacional) for Costa Rica for the year 2010. In contrast to the situation in Guatemala, the dominating fuel is petroleum. The other two important feeds are from hydro and geothermal. Wood is used as heat source in private homes (17,746 TJ), and, with about the same amount, biowaste (residuos vegetales) constitutes an energy source for industry (17,607 TJ). Flows are in TJ. The diagram is provided by the Ministry for Environment, Energy and Telecommunications. 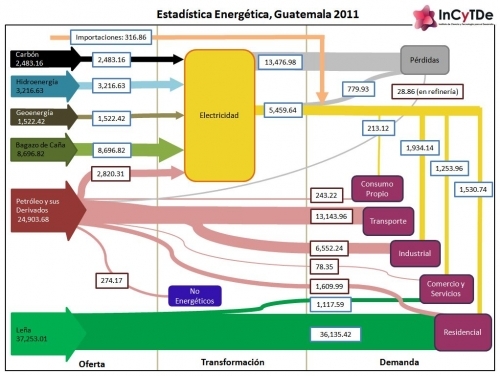 The research institute with the hard-to-pronounce acronymic name INCyTDE (Instituto de Ciencia y Tecnología para el Desarrollo at Universidad Rafael Landívar in Guatemala) has published a Sankey diagram with the energy flows for their country for the year 2011. In regard to design the diagram has many issues: Apparently it was created using a drawing tool that supports primarily horizontal and vertical arrows and Bezier curves. But the diagram loses a lot with branching and joining of arrows almost non-existent. Flows are more or less to scale. The unit is not shown in the diagram itself, but explained in the text (kilo barriles equivalentes de petróleo, KBEP = kilo tonnes of oil equivalent, ktoe). Data is from national statistics published by the Energy and Mining Ministry. 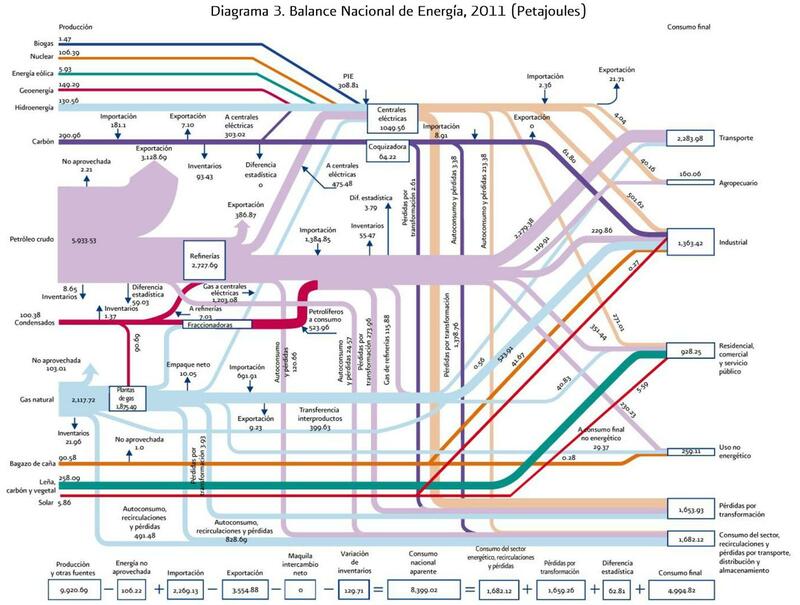 The content of the energy balance diagram is quite interesting, especially if you compare it to similar diagrams of other countries or the world average. Wood is the most important energy in Costa Rica (green arrow ‘Leña’, 37.251 ktoe in 2011). Bagasse from sugar cane (dark green arrow ‘bagazo de caña’, 8.696 ktoe in 2011) is used for almost half of the electricity generation. Petroleum and derivates (dark pink arrow, 24.903 ktoe in 2011) however do play an important role for vehicles (transportation). 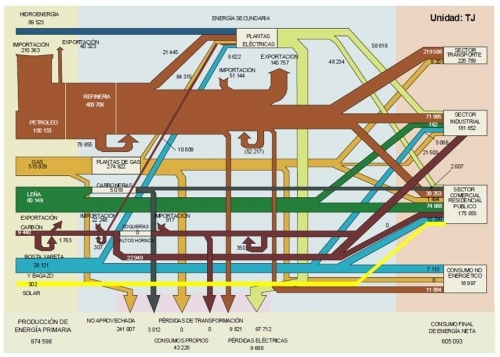 Came across this Sankey diagram showing the energy flows in Peru in an article on Renewable Energies in the Energy Strategy on Alberto Ríos Villacorta’s blog. 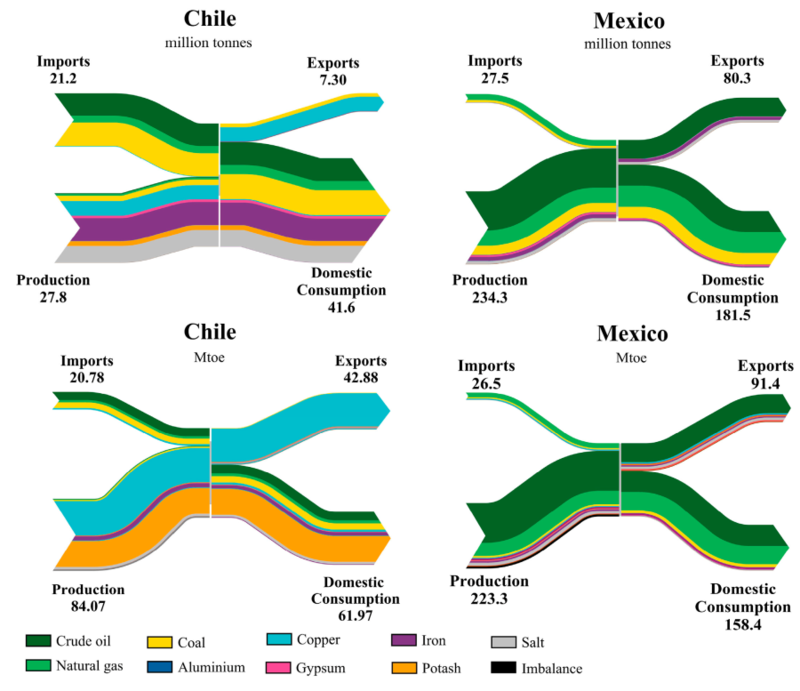 It has the typical structure of a national energy flow Sankey diagram as I have shown here on the blog many times. Flows are in terajoule (TJ) and have a general left-to-right orientation. On the left are the different energy carriers (primary energy), conversion in the middle section, consuming sectors on the right. Losses branch out to the bottom. Unfortunately the streams are not to scale in this Sankey diagram. Compare for example the 80.149 TJ energy from “leña” (wood) in green to the 515.929 TJ of energy embodied in gas (sand color) right above. The gas arrow should be approximately 6 times wider – still it is drawn thinner. Even worse the situation for losses in gas processing where 241.007 TJ are “no aprovechada” while 274.922 TJ pass through gas processing (“planta de gas”). Roughly half of the energy embodied in gas is not used, but it looks as if that arrow branching out to the bottom represents some 10 to 15% of the total flow only. Many other examples of wrong arrow magnitudes can be found. So, some very general basics of Sankey diagrams are ignored here. Readers should check the flow quantities carefully, and not rely on the perceived quantities represented by the arrows.